Many Japanese let out a gasp of suprise when the 新元号 (shin-gengō, new name of the Imperial era) of 令和 (Reiwa) was announced on April 1. It was the first time in history that the 元号 (gengō, era name) was announced ahead the new Emperor’s ascension to the throne and a considerable amount of suspense had been building as to what it might be. But then again, the Japanese have a tendency to get excited about new things, which are usually expressed with the kanji 新 (shin, new). 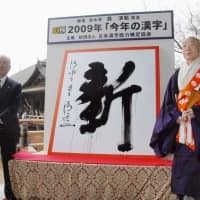 Ten years ago, 新 was voted kanji of the year to reflect the wave of “new ideas and hopes” that were introduced to Japan in 2009. The kanji itself comes from China and is made up of the radicals derived from needle and tree on the left, and axe on the right. A long time ago, when your parents died you would toss a needle toward a group of trees and whichever one it hit would be the one you chopped down to create a memorial tablet. It’s a much harder mnemonic than the one for 魚 (sakana, fish), which just looks like a fish. 新 is used in a lot of different words, and a few that come to mind — especially now that the 新年度 (shin-nendo, new fiscal year) has kicked in — are 新入生 (shin’nyūsei, new students), 新学期 (shingakki, new semester), 新入社員 (shin’nyūshain, new employees) or just 新人 (shinjin, newbies) for short. It comes in other guises, too. “Shin” is the 音読み (on’yomi, Chinese reading) but the 訓読み (kun’yomi, native Japanese reading) has it as atara, ara and nii. Stick some kana on the end of 新 and you can get the adjectives 新しい (atarashii, new) or 新たな (aratana, new/fresh). Just note that the former can modify a noun or be used on its own, as inこれは新しいです (kore wa atarashii desu, this is new), while the latter needs to be paired with a noun 新たな生活が始まる (aratana seikatsu ga hajimaru, start a new life). 新 can also be read as nii, most notably in 新潟県 (Niigata-ken, Niigata Prefecture). 新しい時代を迎える (atarashii jidai o mukaeru, welcoming in the new era) is a phrase you’ll likely hear quite often for the next couple of months, as Heisei exits the stage to make way for Reiwa. 新たな気持ちで生きる (aratana kimochi de ikiru, to live with a new mind-set) is another phrase, most often appearing in commencement speeches. Why the national obsession with newness? Theories abound but the one repeated most often is that the Japanese have traditionally lived with the seasons and prefer to face life anew every three months or so. At no time is this felt more than during 春 (haru, spring). Nature abounds with newness in the spring. There’s 新緑 (shinryoku, new greenery), 新婚 (shinkon, newlyweds) and 新生活 (shinseikatsu, new life). It’s the time to 新調する (shinchō suru, make new) by buying new clothes and accessories that might help you 気分を一新する (kibun o isshin suru, refresh your spirits). Many Japanese will choose this time of year to 家を新築する (ie o shinchiku suru, start new construction on a house) or 新居に移る (shinkyo ni utsuru, move to a new place) as it’s believed to bring in good luck (though, coinciding with the shin-nendo, moving to a new place may just mean that your company has shipped you off to a branch halfway across the country as of April 1). Speaking of moves, when Japan opened its doors to the West in the late 19th century and people began to travel across the ocean, other countries were often referred to as 新天地 (shintenchi, the new world) where you could potentially start life fresh, away from the obligation of tradition and society. The term 新天地 is still very much in circulation, mostly as company jargon that describes a new position or department. 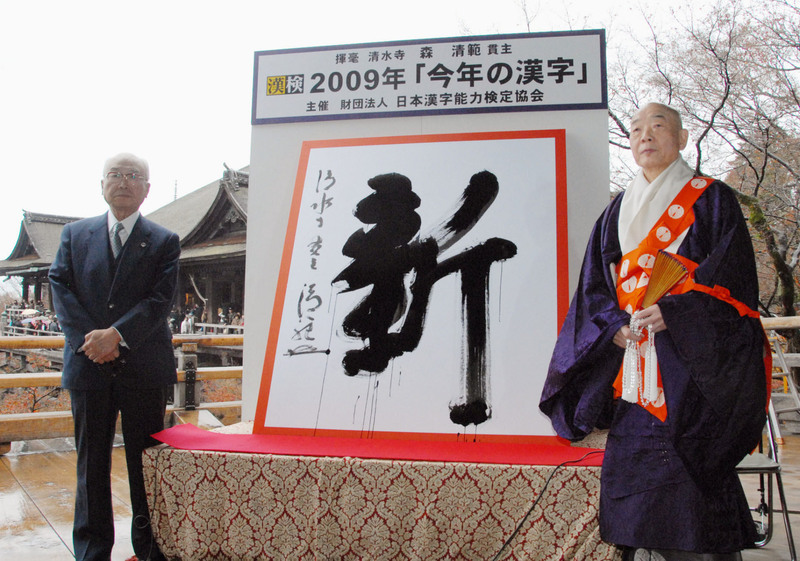 Despite the huge popularity of 新, the kanji has never been used in the name for an Imperial era. Not once. The kanji most frequently used for this purpose is 永 (ei), meaning eternity or permanence which has appeared 29 times in the past 1,374 years. The kanji for 天 (ten, heaven) and 元 (gen, origin) tie for second at 27 times. 一方で (ippō de, on the other hand), the 令 (rei) in the newly announced 令和時代 (Reiwa jidai, Reiwa Era), is a first-timer so perhaps 新 will get a new look one day. That means, according to the government, Silicon Valley will be written as it’s most often pronounced: シリコンバレー (Shirikon Barē), instead of シリコンヴァレー, and Vivian Westwood will be known to bureaucrats as ビビアン instead of ヴィヴィアン. There’s no word on whether Osamu Dazai’s classic novella “ヴィヨンの妻” (“Villon no Tsuma,” “Villon’s Wife”) will become “ビヨンの妻,” but I sincerely hope not. On the other hand, バレーボール (barēbōru, volleyball) will remain the same. The administration of Prime Minister Shinzo Abe decided to give ヴ the axe because it was confusing and difficult to pronounce. The new rule has already been applied to the names of two foreign nations: The Federation of St. Christopher and Nevis (セントクリストファー・ネーヴィス) in the West Indies, and the Republic of Cabo Verde (カーボヴェルデ) off the coast of Northern Africa. From now on, they’ll be セントクリストファー・ネービス and カーボベルデ, respectively. On social media, the response to the action has so far has been negative, with people accusing the government of lowering the standards of English pronunciation inside Japan. Apparently, though, we’re still free to pronounce “vu” orally, and speak English as correctly as we wish. Thanks, but not サンクス (sankusu).